are integral to the owners' mission -- they are self-dubbed 'eco-preneurs'-- to both delight and educate their guests. They insisted on comprehensive resource- and energy-efficient design which would enhance a high-quality hospitality experience. The Arbor House includes the Annex and an historic inn dating from the 1840's, one of first structures built by European settlers to the Madison area. The new Annex contains three guest suites (one fully accessible for guests with disabilities), the timber-framed Breakfast Room and the owners' living quarters. The existing Plough Inn contains 5 more guest suites and several small common areas. The site is located on a busy cross-town route, at the edge between a mature residential neighborhood and a 1,280 acre arboretum managed by the University of Wisconsin as a natural preserve and research forest. This project was subject to strict historic review, although the exterior of the original building was not touched. The inn has always been a much beloved feature of the neighborhood, and residents were wary of any changes. However, the deferred maintenance on the historic inn made it only marginally successful and it had changed hands several times in recent years. 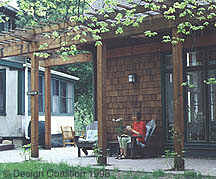 The extra guest rooms in the Annex and the live-in home owners have made the site an economically viable inn once more. • The Arbor House Annex facility and John & Cathy Imes' "sustainable hospitality" have also earned national recognition and won numerous other awards.